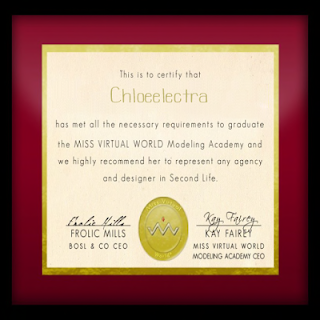 On Friday, I received my certificate of graduation from the Miss Virtual World Academy (15-17 Feb 2013). What first came to my mind was the plethora of feelings that had taken me over those 3 days; frustration, excitement, impatience, happiness, anxiety and so on. I had spent countless hours on the Internet looking for inspiration, on the SL Marketplace and in-world stores looking for items and then the process of putting all my new acquisitions together in outfits that would blow minds away. The result was - however - more than rewarding; on Sunday evening and while being exhausted and getting ready to go to bed, the results came out. I was a Miss Virtual World Modeling Academy Graduate. The expression on my face was priceless ad I felt like bursting into laughter and tears at the same time! It was a magical moment! For quite some time, I had in my mind that I was going to apply to this Academy and get trained by instructors who are very well known and recognised for their contributions to the world of SL Fashion. However, that took quite some time as I wanted to grow some more before doing so. I needed to know I was ready to do this major step, and that day came... and passed! People who know me on a personal level are aware of my tendency to thank and not forget all those who helped me - one way or the other. So I am going to write down some names hoping I won't forget anyone; if that happens, PLEASE do let me know. It is very important for me to express my appreciation to all of you.